This project continues Dr. Chen Zhao’s work on modelling the Hochifen-Gottesacker alpine karst system. Because groundwater in karst flows through discrete passageways rather than through the pore spaces of sediment, karst systems are difficult to model, and models often rely on knowledge of the exact subsurface conduit geometry, which is often unavailable. 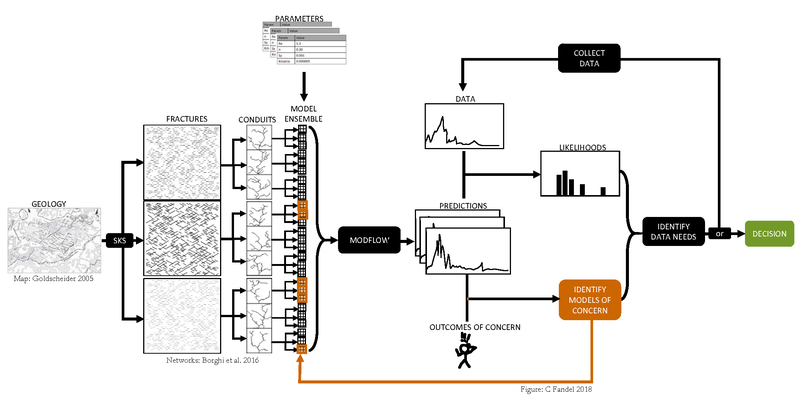 This project draws on existing datasets (Goldscheider 2005, Göppert & Goldscheider 2008, Chen & Goldscheider 2014) and an existing SWMM flow model (Chen & Goldscheider 2014, Chen et al. 2017) of the Hochifen-Gottesacker system. We will translate the model into MODFLOW, using the CFP (Conduit Flow Process) package, which will add the ability to model reactive solute and contaminant transport. To minimize the model’s dependence on necessarily imperfect knowledge of the conduit geometry, we will statistically generate multiple plausible geometries, based on the existing data. We will then compare discrepancies between model results for each of these possible geometries, and identify what additional data is needed. Finally, we will collect the necessary data and use it to discriminate between the candidate model geometries and improve model performance.